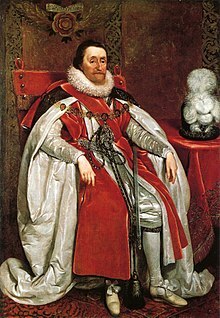 His reign was important because it was the first time England and Scotland had the same monarch. He was the first monarch of England from the House of Stuart. The previous English monarch had been Elizabeth I. She had died without any children, so the English agreed to have a Scottish monarch because James was the son of Mary, Queen of Scots, thus the closest relative Elizabeth had. By being king of both, he created a personal union. James fought often with the Parliament of England. In addition, he did not use the kingdom’s money well. While James was ruling, the Scottish and English governments were quite stable. After James died, his son Charles tried to rule in the same way as James, but caused the English Civil War. At the end of the war in 1649, Charles was executed. James was very well educated and good at learning. He helped people in England to study things such as science, literature, and art. James wrote Daemonologie in 1597, The True Law of Free Monarchies in 1598, Basilikon Doron in 1599, and A Counterblaste to Tobacco in 1604. He sponsored the Authorized King James Version of the Bible. James was a target of the Gunpowder Plot. A group of Catholics planned to blow up the Houses of Parliament on 5 November 1605 during a ceremony while James was in the building. The plot was stopped when a member of the group, Guy Fawkes, was found in a basement with barrels of gunpowder. The event is remembered every year on 5 November, also known as Bonfire Night. James believed in witchcraft. When he read The Discoverie of Witchcraft, he ordered all copies of the book to be burnt. The king had an importance with the first English settlers.